I am in love with this cute Halloween spook garland from Organize and Decorate Everything. What isn't to love about this cute pennant shaped Halloween fun. The kiddos could easily help with this one. Even if they are little, you could cut out all the shapes and just let them help assemble the monsters, owls, candy corns, ghosts, pumpkins, and cat. I think the only thing missing is a bat. I might have to add that to the garland. 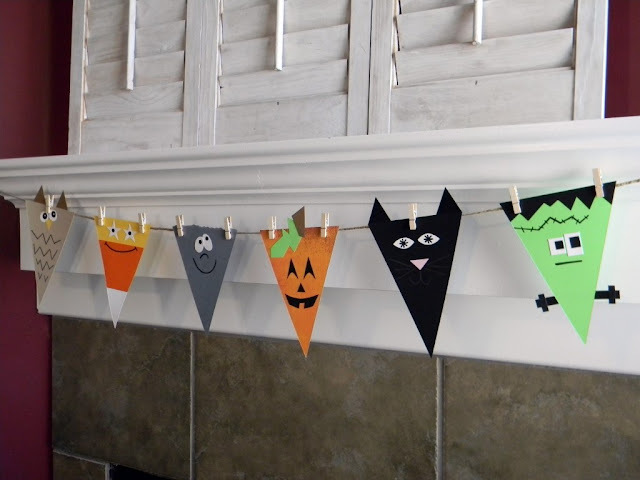 You can check out how to make a Halloween spook pennant banner HERE. Thank you for sharing my Halloween Banner. What a nice surprise! Have a great day! LOVE this! Easy, inexpensive, ADORABLE! The sight of this on the mantle would make my kids so happy. Who am I kidding, it would make ME so happy! completely adorable. These kinda things always make me want a mantle.